This article was originally published in The Writer magazine under the title Writing Secrets of the Ancient Greeks, March 2008 issue. Did you know Aristotle was a warg? Neither did I. 2500 years ago, the rules of storytelling were laid down by a man who was, according to legend, the last person to know everything. He was a philosopher, physician, scientist, and student of Plato. Today, the name of Aristotle is synonymous with scientific and philosophical brilliance. But did you know he was an expert on writing as well? In his unfinished work The Poetics, Aristotle set forth several simple rules to help erstwhile authors achieve that celebrated Greek ideal: perfection. Not only are most of these rules applicable to modern fiction, drama, and film, but many of them are even being marketed by modern so-called ‘story experts’ as their own. These people would have you believe that their wisdom comes from years of experience and analysis, but in fact the elements of storytelling have been known for millennia. You can save yourself a lot of time–and workshop fees–by going closer to the source yourself. Following are just a few gems from a vast treasure trove that, as part of our cultural heritage, is free for the taking. The novel was unknown in ancient Greece, but Aristotle was well versed in the most popular form of entertainment of his time: the play. He was not, as far as we know, a playwright himself. But he applied to the theater the same spirit of inquiry and examination that he showed in all subjects. Soon enough, he noticed that successful plays had certain things in common. Following are just five of his many observations, which are as relevant to writers today as they were when he first put quill to sheepskin. 2. Plot is everything. ‘The first essential, the life and soul, so to speak, of a story, is the Plot,’ wrote Aristotle. People have paid vast sums to be told what this son of a Thracian doctor has been trying to tell us for free all this time: We can forgive a good story badly told, but we will never forgive a bad story wrapped in flowery prose. 3. Characters come second. After fleshing out a plot, the next important question is: Who are the actors? For a character to work, Aristotle wrote, four aspects must be developed. First, she must be ‘good’, which means not that she is a nun or a Girl Scout, but that she possesses some innate, redeeming quality that wins the respect of your readers. Second, she must be ‘appropriate’–that is, her various qualities must make sense, based on her identity. For example, a serving girl should not live in a mansion, and a queen should not be washing dishes. The third quality is that she must be ‘believable’, or realistic; we have to believe that this person could exist, even though we know it’s a work of the imagination. The fourth quality is consistency–a character should not be stark raving mad on one page and utterly sane on the next. 4. Reversals and Discoveries. Keep your readers hooked by making use of reversals (Aristotle called them ‘peripeties’), which happen when things in your story change from one state to its opposite–that is, for example, when a wedding feast (a happy event) is marred by the sudden death of the bride’s father (a sad one), or when a baby is born (a joyous occasion) in the middle of a hurricane (a disaster). 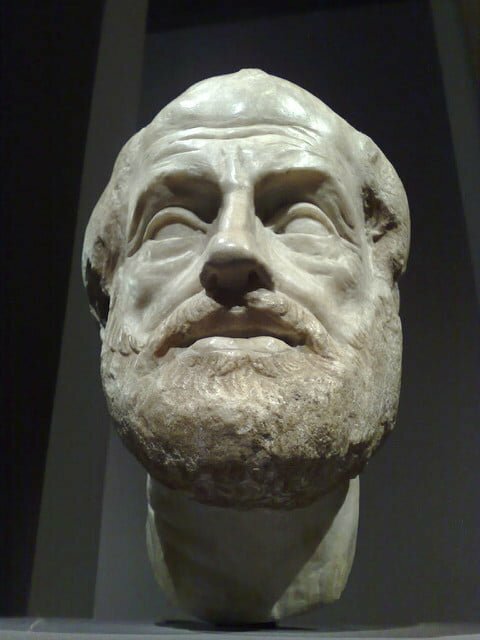 By discoveries, Aristotle meant those moments when your hero learns something, either about himself or one of the other characters, which has an impact on the direction of the story. We might think of these today as simple plot twists. But there is really nothing simple about plot twists, at least not when done well. They are at their most effective when they fulfill a certain set of expectations. Aristotle would caution us against throwing some bizarre kink into our narrative just for the sake of being outrageous, because this is not good storytelling. ‘The finest form of Discovery is attended by Peripety,’ he wrote. In other words, it’s most satisfying to your readers when a reversal arises directly out of a discovery. Here’s one example from a play that most of us had to read in high school, and which is contemporary with Aristotle himself: Oedipus the King. When Oedipus learns that the woman he’d recently slept with was his mother–a discovery–this is the cause of his reversal from happiness to misery. This new state, in turn, leads to his eventual self-mutilation and exile. Imagine how much less effective the story of Oedipus the King, which Aristotle considered the finest tragedy ever written, would have been had the hero never learned the truth about his mother. Or, imagine if his blindness had arisen from some other cause–a war, or a disease, for example. Would those elements of the story still have the same dramatic impact if one did not come from the other? Why else are discoveries and reversals important? Because they help provide the broad emotional range that spell the difference between regular old fiction and great literature. The best stories don’t just explore one feeling, but cover the gamut of human emotion. And, while we’re on the topic, what is the difference between fiction and literature? The former merely entertains; the latter has the power to remind us of our common humanity, and even to change lives for the better. 5. The perfect plot is simple, not complex. Anyone who has ever spent months or years working on a story only to be told that there was too much happening will appreciate this one. In our attempts to create stories that readers find interesting, we often can err too far on the side of caution by stringing together incident after incident, until we have a theoretically endless chain of cause-and-effect. How is one to know how much is enough? Our old toga-wearing friend had an answer for that one, too. ‘The Plot should be so framed that, even without seeing the things take place, he who simply hears the account of them shall be filled with emotion at the incidents,’ he tells us. Stop and think for a moment of your favorite novels or movies. How easy is it for you to explain to someone else what they’re about? Most likely, your answer is ‘Very.’ As my own editor at HarperCollins, Marjorie Braman, told me many times, if you can’t explain the gist of your story in two or three sentences at most, then it’s not ready yet. So, what is the best way for modern writers to incorporate Aristotle’s advice? The most helpful approach would be to get together with your writing group and discuss the above points. Do you see ways in which these steps can be used to help improve your own work? Or, if you’re feeling ambitious, get a copy of The Poetics for yourself and read it. In this case, I would also recommend starting a discussion group. Aristotle is much easier to read when you have people to talk him over with–and he-‘s well worth the effort. By the way, what happened when the ancient student of writing achieved the goal of all literary hopefuls–publication, or in the case of dramatists, production? Everything afterwards was smooth sailing, right? ‘Because there have been poets before him strong in the several species of tragedy, the critics now expect the [writer] to surpass each one of his predecessors,’ Aristotle intones. In other words, twenty-five centuries ago, authors were already awaiting their reviews with butterflies in their stomachs. Thanks for this information. The Poetics is now a member of my library. I appreciate your sharing. I particularly liked the bit about reversals and discoveries. It gave me new understanding of how to create tension. This also explains why Aristotle managed to captivate the best minds of Western civilization for two millenia. Aristotle said that what gives a story unity is not as the masses believe–that it is about one person–but that it is about one action. He distinguishes that one unity of action from the many actions proper (commonly called plot, which he put as the most important thing). What gives an essay unity is that it is about one idea. Fiction puts the idea into action, two actions really: the actions proper, what the characters do, say, and think, and the one (archetypal) action that the story is really about. Thank you for this really insightful comment! I appreciate you taking the time to write.